Californians drive automobiles or autos at least as much as they drive cars — a sign saying “Auto Toll” on a toll booth doesn’t mean the toll is automatically collected, as it probably would in Australia or Britain, it just means that the toll booth is for cars only. Cars have hoods rather than bonnets, trunks rather than boots, windshields rather than windscreens, gas pedals rather than accelerators, emergency or parking brakes rather than hand brakes, tires rather than tyres, turn signals rather than blinkers, and license plates, not number plates. Confusingly, although cars are usually registered, you will often be asked for your car’s license or license number — in this case they want the number plate or registration number. The disks in disk brakes are called rotors. Cars are parked in parking lots, not car parks. Streets meet at junctions as well as intersections. Cars pass slower cars rather than overtake them; intersections are often controlled by stop lights rather than traffic lights. Lorries (or, if you’re Australian, “semis”) are trucks, eighteen-wheelers, big rigs, or, increasingly, semis (often pronounced “see-meye” or “sem-eye”); caravans are trailers. 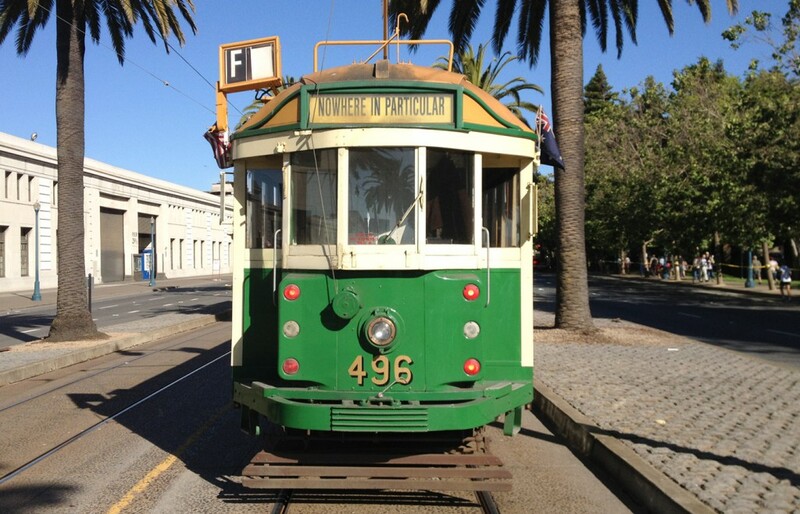 Trams are street cars or trolleys. Those huge self-propelled house-on-wheels things that choke up the highways are called recreational vehicles, RVs, or motorhomes. A mini-van is what you and I would call a van (i.e. something the size of a Volkswagen Kombi or similar Japanese van); the word “van” usually refers to something much larger — those large Ford or GM conversions that probably seat fifteen people and often have all sorts of external ladders and frills attached. What Australians call utilities (“utes”) Americans call pickups. Trucks and cars stop at rest stops or truck stops off freeways (not Motorways); lookouts are vista points. 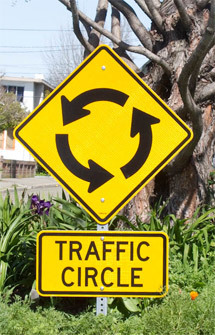 Roundabouts are usually called traffic circles. Railway stations are train stations (and railways are railroads) — the use of the word “station” on its own here is uncommon: it’s nearly always given with a modifier like “bus station”, “postal station” (i.e. something like a British sub-post office), or “train station” (and, given the general lack of passenger trains in this part of the world, the word “station” on its own will almost never refer to a train station). Pedestrians walk along sidewalks (a footpath is generally something that hikers use, and pavement is what covers roads); they cross the street at crosswalks (and doing so illegally is called “Jay-walking“). The center of a city is almost invariably “downtown“, used both as a noun and an adjective (e.g. : “I’m going downtown today”, or “They’re rioting again in downtown Berkeley”). “Downtown” may or may not include the city’s shopping center as well as the business center (the latter may be called the financial district). Americans buy gas at gas stations, rather than petrol at petrol stations (and gas comes in US gallons not litres). Gas stations have restrooms (or, at a pinch, bathrooms), not toilets — the word “toilet” seems vaguely rude in American usage, and is almost never used in public. Restrooms have faucets, not taps (but the water that comes out of them is called tapwater). You pay your check with bills (i.e. your bill with dollar notes). Cheques are checks. Five cent coins are nickels, ten cent coins dimes, 25 cent coins quarters, one cent coins, oddly enough, are pennies. No one ever uses the numerical name for coins — people generally won’t have a clue what you’re talking about if you say “five cent coin”, for example. You wait in line (rather than queue) for service; you typically do this at stores rather than shops. Pubs are usually bars. Housing estates are projects. Foreigners are often officially called aliens, leading to some weird signs and notices at places like airports (“Aliens Use Gates 1-6”). People eat french fries rather than chips, and (for the British) chips rather than crisps. Californians hitch or give rides rather than lifts. People of both sexes here have a fanny — in American English the term means buttocks — so what Americans call a “fanny pack” (“bum bag” in colloquial Strine) doesn’t sound quite as bizarre to Americans as it does to Britons or Australians. Californians (and Americans in general) sometimes don’t distinguish between “insure” and “ensure“, using “insure” to cover both cases, which really grates on British ears (but has precedent and the New Yorker and the New York Times on its side). In this country, “momentarily” usually means “in a moment” rather than “for a moment” — when an American airline pilot announces you’ll be landing in San Francisco “momentarily”, it doesn’t mean you’ll have to rush for the exits. “North” is sometimes abbreviated “No“; “South”, “So“, sometimes leading to confusing bus destinations like “No Berkeley BART” or signs like “So. Sacramento” (presumably this is read aloud dramatically as “So. Sacramento!”). “Cyn” is a common abbreviation for “canyon”. The use of the words “double” or “triple” in spoken phrases like “double 2” (for 22) or “double l” for “ll” is rarely used or understood, especially when giving phone numbers (and yet the Automobile Association of America is universally referred to as the “triple-A”). For example, the phone number “555 8899” should never be given as “triple-five double-eight double-nine”; it must be given as “five-five-five, eight-eight nine-nine” or “five-five-five eighty-eight ninety-nine” to be understood at all (this seems to be a West Coast or California thing mostly — in my experience, people in other parts of the country have less trouble with this). Dates are normally written in Month / Day / Year form, e.g. 5/21/10 or May 21, 2010 rather than the international Day / Month / Year convention (e.g. 21/5/2010); this can be really confusing for foreigners (it’s still confusing for me after all the years I’ve lived here). Americans take public transit or mass transit (where it exists), rather than public transport; public phones are pay phones (and, astonishingly, they tend to work most of the time, even if there are very few left now that mobile (cell) phones are everywhere). Public toilets generally don’t exist (you have to try to find a toilet (sorry, “restroom”) in a likely-looking mall, store, or bar, often having to ask the owner or store attendant for the key; in any case, many cafes or restaurants won’t let you use their restrooms unless you’ve eaten there). The ground floor (street level) of a building is always the first floor; the term “ground floor” will provoke blank looks if used. Off-licenses (English) or bottle shops (Australian) are liquor stores (and are usually only found as liquor stores in the rougher parts of town; the rest of us get our beverages — never simply drinks — at bars, supermarkets, or specialty wine stores). When a Californian asks you “What’s up?“, they’re usually not asking “What’s the problem?”, but rather, “How are you?”, “What’s going on?”, or “What’s happening?”. When a Californian asks “What school did you go to?”, they invariably mean what college or university did you attend — not which primary, secondary, or high school, as the rest of us in UnAmerica would assume. The word upside means above, towards the top of, or on top of something (e.g. “I’ll slap you upside the head”, or “Put it upside the shelf”); in back of means behind, i.e. “It’s in back of the store” means “It’s behind the shop”, not “It’s in the back of the shop” (as I once thought). When a Californian says “I could care less” they mean they couldn’t care less (this one is common in the rest of America, too). And like the rest of America, the word “literally” almost always means “figuratively” here, e.g. “When I heard that, my head literally exploded (dude!!! )”, or “She lives literally millions of miles away!” (presumably then, she’s one of those for whom the “Aliens Use Gates 1-6” signs at SFO are meant literally). Earthquakes are often referred to as temblors (see e.g “4.4 temblor rattles Riverside County” for a common usage). The word is Spanish; many people (even Californians) seem to think it’s actually “tremblors” or some such variant to do with “tremble”). And finally, some useful geographical short-hand terms you’ll hear in everyday conversation, news items, etc. here whose meaning may not be obvious to non-locals: “the Bay Area“ nearly always means the greater San Francisco Bay Area centered around San Francisco Bay, and is usually thought of as including at least San Francisco, San Jose, Silicon Valley, Oakland, Berkeley, Marin etc., sometimes extending into the Delta and / or Central Valley; sometimes this is referred to as the “nine county area“, meaning San Franciso, Alameda, Contra Costa, San Mateo, Santa Clara, Marin, Solano, Sonoma, and Napa counties; the “East Bay” is used as shorthand for Oakland, Berkeley, Fremont, Richmond, El Cerrito, etc., on the east side of the San Francisco Bay; “the Peninsula” usually refers to the various cities on the San Mateo peninsula just south of San Francisco right down into Silicon Valley, including places like (in no particular order) Mountain View, San Carlos, San Mateo, and Palo Alto; “the wine country” usually means Napa and Sonoma counties; “the Redwood Empire” usually means the coastal and near-coastal area stretching north towards Oregon from San Francisco, including Marin, Sonoma, Mendocino, Humboldt, and Del Norte counties; “the Southland” (sometimes “the great Southland”, with that “great” often used ironically) normally means the greater Los Angeles area including most or all of Los Angeles County, Orange County, San Bernardino County, Riverside County and Ventura County (i.e. a big place with maybe 15 million or more people living in it); “The Central Valley” usually refers to the vast Central Valley that stretches through the middle of the state, and includes the Sacramento Valley (the northern half, roughly), the San Joaquin Valley (the southern half), and the Delta (the bit in the middle where the Sacramento and San Joaquin rivers merge and flow through an inverted delta into the San Francisco Bay); the Central Valley is often confusingly just called “The Valley” by northerners, but “the Valley” as used in the Southland usually means the San Fernando Valley, the original “Valley Girl” homeland northwest(ish) of downtown LA; “the Inland Empire” is a part of the Southland embraced by Riverside and San Bernardino Counties. On the car front, “Nissan” is pronounced “NEE-sahn”, “Datsun” is “DAHT-sun”, “Mazda” is “MAAHHZ-duh”, “Hyundai” is “HUN-day”, and “Jaguar” is “jag-WAH” (which really grates on British or Australian ears). “Carburettor” is spelled “carburetor” and pronounced “car-byou-RAY-tuh”, with an inexplicably-long (and emphasized) “a” where the rest of us use a short “e”. “Premier” is sometimes pronounced “PREEM-yair”; “prelude” as “PRAY-lude”. And yes, a significant number of Californians (and Americans in general) pronounce “vehicle” as VEE-HICK-KULL. The word “khaki” is pronounced “cacky”, so don’t take offence when someone seems to be commenting on your cacky clothing. “Caramel” is usually pronounced “CARmel” (and increasingly spelled that way); “herb” is usually “erb” (i.e. without the “h” — I’ve been told several times, in all seriousness, that it’s pronounced like this because it’s a French word…). Similarly, “filet” and fillet” are almost always pronounced “fill-EH”, i.e. the psuedo-French way (there’s a word for this; I’m always amazed more Americans don’t pronounce claret “cla-ray” (well, some do); and how long will it be before we hear “toilet” pronounced “toy-leh”, eh?…). “Era” is usually pronounced the way Britons or Australians would pronounce “error” — there’s a local radio station around here that used to use the slogan “We play the best from all musical eras!”, which certainly gave me pause for thought when I first heard it (sounded like just my kind of music). “Nikon” is of course always pronounced “NEYE-kon”, i.e. with a long “i”. “Aluminium” is spelled “aluminum”, and pronounced that way, i.e. “uh-LOO-mi-num”. The letter “Z” is pronounced “zee”, leading to product names like “E-Z Kleen” or “La-Z Boy” (I still read the latter as “Lah-ZED-boy” after all the years I’ve been here). “Garage” is another of those words pronounced the pseudo-French way, “guh-RAHZH”, as is “beret” — “buh-RAY” (again, I’m told it’s because they’re French words — never mind that they’ve been in English for literally centuries…). The geographical term “slough” is pronounced “slew“, and “Butte” “byute” (both words are common geographical descriptions and parts of names in at least the San Francisco and Central Valley areas, so you’ll need to pronounce them the Californian way here to be understood). “Clerk” is always pronounced “clurk”, not “clark”. “Vase” is mostly pronounced so it rhymes with “daze”. “Buoy” is almost invariably pronounced “boo-ey” (rhymes with gooey). People’s names usually come in for strange Californian or American transmutations; for example, Cecil is usually “SEE-sill”, Cedric typically becomes “SEED-ric” (not that Cedric is a common name anywhere, but never mind), Kevin is sometimes “KEE-vin”, Colin is of course “KOH-lin” (you can see the pattern here — everything is bigger in California, even the vowels…). Caitlin is universally pronounced “KATE-lyn”, even (especially!) by people who proudly think of themselves as “Irish” (there’s a fairly striking correlation here in California (at least) between the strength of personal identification with some ancestral ethnicity and the inability to correctly pronounce or use names and words from that ethnicity). Barry is usually pronounced something like “berry”, Gary is gairy, etc. Les is pronounced “less”, Leslie as “LESS-lee”. “Celtic” is always pronounced with a soft “c”, i.e. “selltic”. In some places Sean is actually pronounced “seen” (as someone famous once said, I’m not making this up, you know…). “Louis” is almost always pronounced “Lewis”; but don’t confuse “Louis” / “Lewis” with “Luis” — the latter is Spanish (and a common enough name in California) and should be pronounced pretty close to the way a Mexican Spanish speaker would pronounce it. The “Gogh” in Van Gogh is usually pronounced “go”, leading to puns that are totally lost on most UnAmericans — for example, there used to be a San Francisco van rental company named “Van Go” (there’s got to be a “Vin Gogh” wine trucking establishment out there somewhere…). I’ve heard Janice pronounced “JANE-iss”, and Cheryl pronounced with a hard initial “ch” (by people named Janice and Cheryl respectively). Dwyer is often pronounced “Duh-WIRE”; similarly, Dwight is often “Duh-WIGHT”. Tara is almost always pronounced “TAIR-uh”, i.e. so it rhymes with “fairer”. “Regina” is always pronounced “ruh-JEE-na”, presumably to avoid the just awful possibility of a mixup with the word it rhymes with elsewhere in the English-speaking world (Americans will go to great lengths on things like this — just try pronouncing “Uranus” the British or Australian way here and see what happens… you’ll probably cause an international incident). A useful rule for Californian (mis)pronunications of names is to stress the last syllable of the name — for example, “Devon” becomes “Duh-VON”, “Burrel” is “Buh-RELL”, “Tyrell” “Ti-RELL”, Rendell “Ren-DELL”, etc. “Marion” and “Lynn” can be men’s names out here, and “Michael” a woman’s. And both sexes are weirdly fond of using last names as first names (think McGeorge Bundy or Clark Kent, or the legions of kids named “Taylor”, “Tyler”, “Cody”, or “Madison”, or the unfortunate use of “Quimby” as a woman’s first name… or indeed, the way “Reid” has become almost exclusively a first name in this country), or investing totally-made-up names with long (mythical) ethnic histories or derivations… (on the other hand, there are some truly splendid names here, my current favorite being Napoleon Hendrix, San Francisco’s one-time stylish, snappily-dressed homicide detective). The many Spanish personal and place names in California are usually pronounced reasonably close to the original — for example “San Jose” is not pronounced “San Josie” (at least not ’round here — I’m told there’s a place in Texas where it’s pronounced that way…), and place names like El Camino Real, El Sobrante, Sonoma, Marin, Ojai, La Jolla, El Portal, San Mateo, and Milpitas should be pronounced pretty much as they would be by Mexican Spanish speakers. You ought to learn to pronounce names like these before using them — Spanish names and words are very common in California (names like the above can be encountered in daily usage anywhere in California), and none of them are pronounced the way a typical Briton or Australian would pronounce them. Pronouncing “Ojai” as “OH-jay”, or “Cajon” so it rhymes with “Cajun” will provoke blank looks or even snickering, and pronouncing “Marin” with the stress on the first syllable is a dead giveaway that you’re from out of state (“San Rafael” is another test, but with an unexpected answer…). Berkeley is pronounced “Burkly”, not “Bahkly”; the town of Verdi, near the Nevada border, is pronounced “VER-dye”, and “Cadiz” (off old Route 66) is “CAY-diss”. Versailles Avenue in Alameda is pronounced “Versales” (really), and in this part of the world “Notre Dame” rhymes with “voter maim”. And Suisun is pronounced … well, I’ll leave that as an exercise for the reader. If you’re interested in the etymologies and pronunciations of Californian place names, I recommend the book California Place Names: The Origin and Etymology of Current Geographical Names, Erwin G. Gudde, 4th Edition (Revised and Enlarged by William Bright), UC Press, Berkeley 1998, ISBN 0-520-21316-5. Note: Americans keep asking me to provide the “proper” pronunciations for the non-Spanish words and names in the paragraphs above, and Britons and Australians (mostly) keep asking for the correct Californian pronunciation of the Hispanic place names. No way — that would spoil all the fun — and besides, they’re pronounced the way they’re spelled, of course :-).